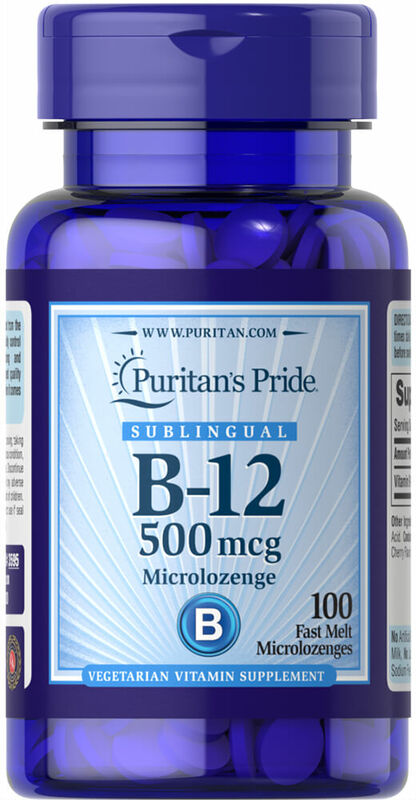 Puritan's Pride's unique B-12 lozenges and dots deliver essential B vitamins for energy metabolism in the body. ** Vitamin B-12 is also essential for the normal formation of blood cells, contributes to the health of the nervous system, and helps maintain circulatory health. ** Adults can take one lozenge or dot daily with a meal. Place lozenge or dot under tongue for 30 seconds before swallowing. No Artificial Flavor, No Preservatives, No Sugar, No Starch, No Milk, No Lactose, No Soy, No Gluten, No Yeast, No Fish, Sodium Free.